We are leading manufacturer of Digital Iontophoresis Machine. We are pioneers in offering a compact range of Iontophoresis Equipment to our customers. It is widely appreciated by dermatologist across the globe as one of the few successful hyperhidrosis treatment of armpits, hand and feet. Iontophoresis therapy for excessive sweating involves passing a low electric current through the affected body part ( usually hand & feet ). The product is quality tested to ensure quality inbuilt in the product and is provided to the customers at very reasonable rates. 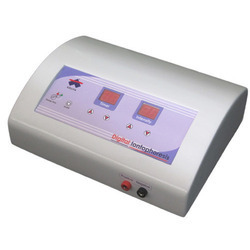 We are pioneers in offering a compact range of Iontophoresis Machine to our customers. It is widely appreciated by dermatologist across the globe as one of the few successful hyperhidrosis treatment of armpits, hand and feet. Iontophoresis therapy for excessive sweating involves passing a low electric current through the affected body part ( usually hand & feet ). The product is quality tested to ensure quality inbuilt in the product and is provided to the customers at very reasonable rates.